As a landlord, what are my responsibilities for repair? What are my responsibilities for repair as a landlord? Having worked with landlords and tenants for years, I find there is a general misunderstanding about maintenance. Section 20 (above) of the Residential Tenancies Act (RTA) may be one of the most important sections of the act for landlords as lack of compliance, can lead to dire consequences ranging anywhere from the inability to obtain an eviction order to an order preventing the landlord from raising the rent. The divisional court decision of Offredi v. 751768 provides an illustration. In this case a number of tenants filed an application against the landlord for general poor level of maintenance throughout the complex. Despite the claims of the landlord who argued that the tenants where responsible for the poor conditions, the judge still found that the landlord is responsible for keeping the apartment unit or complex in a good state of repair and fit for habituation. In this case the tenants were awarded an abatement of rent. Under the RTA there are numerous remedies which would consequence a landlord if found in breach of the landlord‘s responsibility for repair. Below are some examples. 1. If the tenant(s) feels there is a breach of the landlord’s responsibility for maintenance, the tenant may file a T6 application ($45.00) at the Landlord and Tenant Board. The landlord may appear before the Board and may be consequenced through a fine, abatement of rent, termination of tenancy or any other order that the Board considers appropriate. 3. Lack of maintenance may also lead to an Order Prohibiting Rent Increase (OPRI). If the Board finds the landlord is in violation of section 20, the Board may refuse the landlord any rent increase until the landlord has complied with his or her responsibilities. In the city of Toronto a tenant or prospective tenant can go on-line to find if there are building violations in regard to a rental property. The discovery of past or outstanding work orders may dissuade prospective tenant from renting from the premises or current tenants may lawfully use this information against a landlord’s pecuniary interests. One final note, the landlord is responsible for maintenance even if the landlord rented the unit to the tenant “as is”. Regardless of the condition of the apartment unit or complex, it remains the responsibility of the landlord to make sure the rental unit or complex is kept up to the standards of the RTA. Residential Tenancies Act 2006, c. 17, s. 82 (1). Death of a Tenant. Who has rights to the apartment unit? If a tenant of a rental unit dies and there are no other tenants of the rental unit, the tenancy shall be deemed to be terminated 30 days after the death of the tenant. What this means is if the tenant was sole tenant (i.e. the only tenant on the rental agreement) and without a spouse, then the tenancy continues for 30 days after the tenant’s death. During this time the landlord is obligated to give access to the executor or members of the family for the purpose of removing the tenant’s property. After the 30 days, the Landlord may seize the contents of the apartment to either sell it, or retain it. What if the deceased tenant had a spouse living with them, who was not on the lease? Even though the spouse was not a tenant (i.e. is not on the lease) the spouse has 30 days to decide if he or she would like to continue on as an authorized tenant. That means that at the end of the 30 days, if the spouse has decided to stay, they will take on all of the rights and obligations of the deceased tenant, including the continuing of their rental agreement. In other words, the spouse becomes a legal tenant. 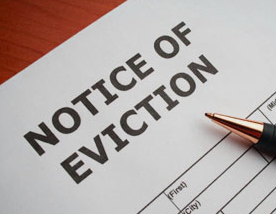 Evicting A Tenant for Non-Payment of Rent? The short lesson is this—although the tenant does have obligations, as the landlord, you do as well, and if you have not met your obligations, you may have difficulty getting an eviction at the Landlord Tenant Board regardless of the how much the tenant may owe.